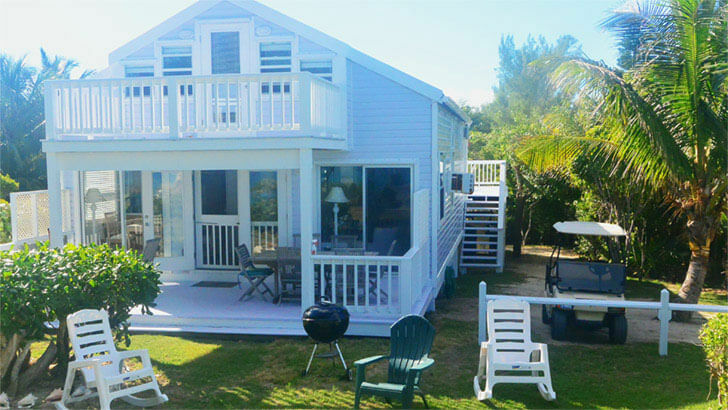 Sleeping up to 6 people, Sea Coral Cottage is designed in traditional Bahamian beach cottage style, fully modernised and refurbished with its new contemporary furnishings it is an ideal luxury beach house. 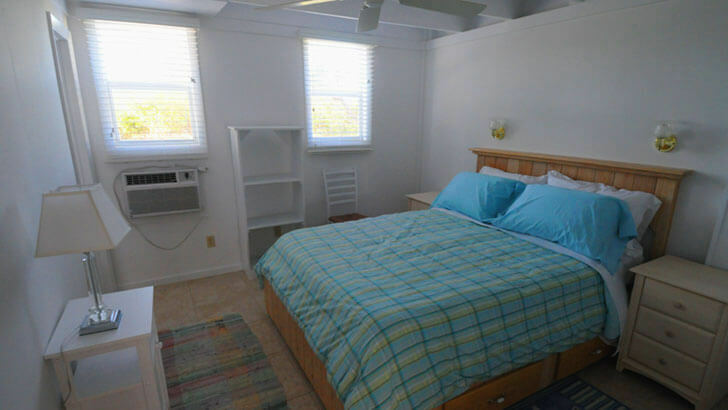 The property has fully insulated walls and roof with tiled floors throughout and all rooms have ceiling fans, screened windows and, for the hotter summer months, air conditioning. The water supply is filtered throughout and there is an additional separate water filter for the refrigerator ice and water dispensers. For emergencies there is a standby generator, which automatically cuts in to give full power when there is a power outage. 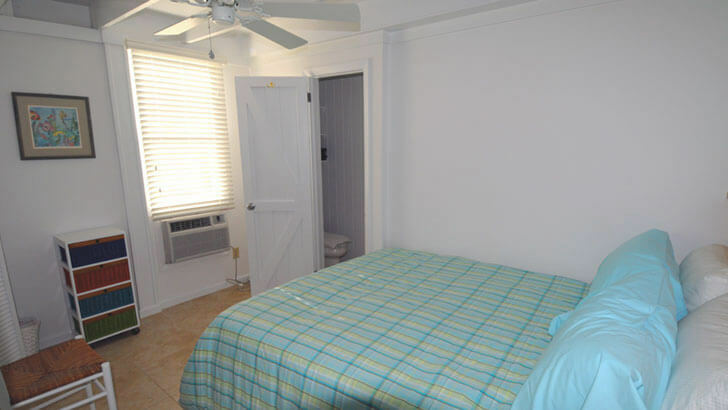 All linen and towels including beach towels are provided. 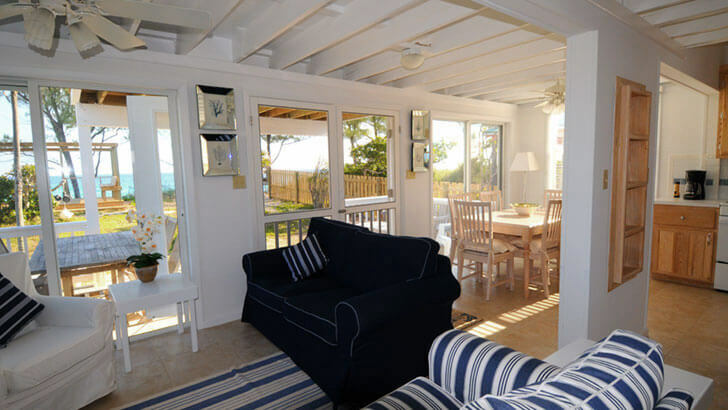 The entrance is from the lower deck (which has a table and 6 chairs for outdoor eating) through the double screened front doors into the open plan living area. The front of the cottage is glazed with spectacular views across the garden to the ocean. On the right hand side is a seating area for 6 with 2 sofas, armchair, satellite TV, DVD and Hi FI. On the left is a dining table with 6 chairs and behind this is the fully equipped kitchen with dishwasher, large refrigerator/ freezer (with ice maker and water dispenser), gas cooker (with 4 ring hob, oven and broiler), blender, microwave, coffee maker, toaster, etc. The two double bedrooms each have queen beds, closets and en suite bathrooms with shower, basin, WC and hairdryers. 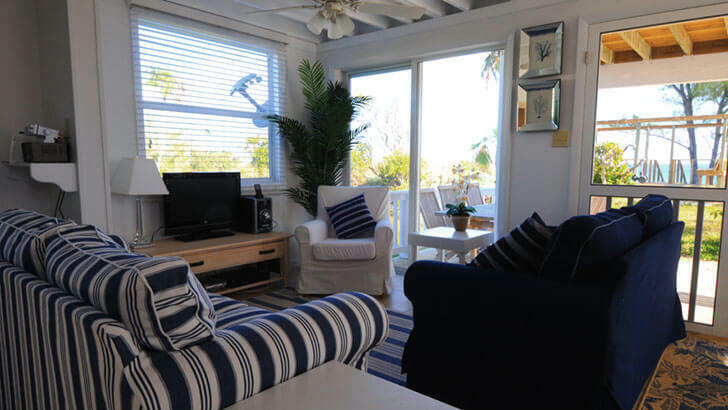 Approximately 20 feet across the garden from the lower front deck is the beach deck, which has spectacular views over the ocean and for several miles along the sandy beach. 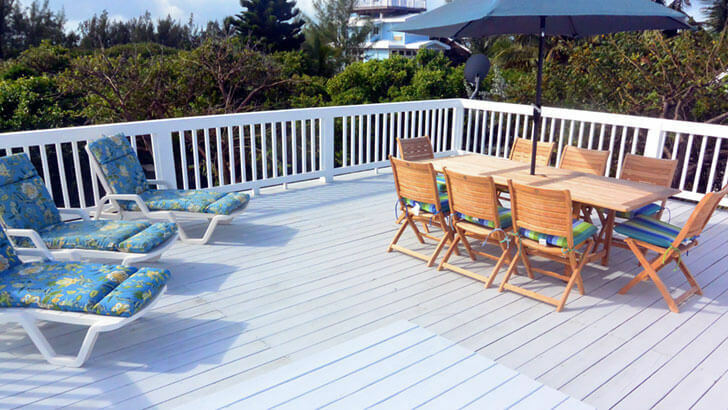 This deck is lit at night and is also equipped with bench seating, shower and steps straight down onto the beach. There are also 6 sun loungers with cushions, several garden chairs and a charcoal Bar-B-Q. There is a large raised rear deck with table and chairs. South facing it is ideal for the late afternoon sun and watching the sunset. 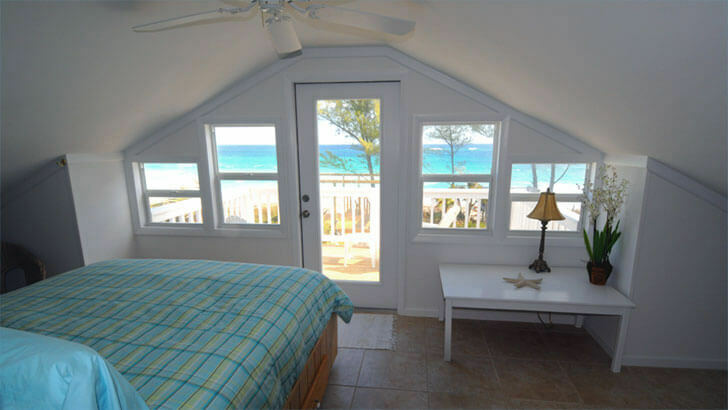 Accessed via the staircase from the lower main living area, the master bedroom has fantastic views of the ocean and beach from the queen bed and from the upper deck just outside the master bedroom. There is a large walk in closet area with hanging space and built in drawers. Outside the master bedroom on the landing is a desk which has free WiFi available from Bahamas Wimax and this is available throughout the cottage.